It began with the three companies Nic, Briceland and Frusco. These companies had a common goal to better and more efficiently serve their marketes. Nic Netherlands is the result of this amalgamation. NIC is born from three Sacdinavian companies: Nimatopaal, Idun and Candeco. All companies have their own specialization in the field of ice cream. Nic is the result of the companies' first letters. Frusco has been a tranding company in the market of soft ice cream for more than 30 years. The Frusco customer base exists of a wide variety of clients in the Dutch market. In addition, Frusco also export products and concepts to several other European countries and also undertakes activities in Asia. 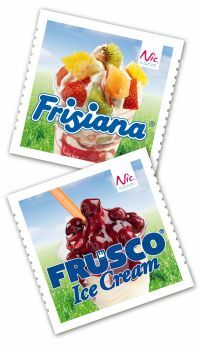 Frusco is specialized in the development of soft ice cream concepts. Briceland was founded in 2007 by the owners of the production company Broer Bakery Ingredients, who bought the (soft) ice cream business and Frisiana brand from Friesland Foods. This trading company started the sales of soft ice cream powder, liquid ice cream, milkshake-, and scoop ic cream mix. Over the years, a complete range of ice cream related products has been added. Briceland products are sold in the Netherlands and some 10 other countries inside and outside Europe. The skills and expertise of each company within their different product groups have created the conditions for a good start for the joint comany Nic Nederland.